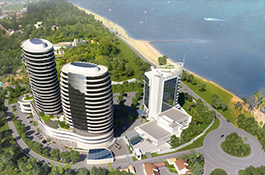 Dubai, 26 October 2015 – Rani Investment, the hospitality and real estate arm of Aujan Group Holding, signed an agreement to appoint Broll Property Group, a world class property services company, to work on the iconic Torres Rani commercial and residential development in downtown Maputo, Mozambique. Under the terms of the agreement, Broll will oversee the commissioning of services and equipment related to the twin-tower project, and also plays a key role role in the handover of apartments and offices as they are completed. Broll has been onsite since September 2015. The Torres Rani development is part of a $206 million joint venture with Minor Hotel Group announced in August 2014. The development also includes a Radisson Blu Hotel, an upscale 154-key property that has been in operation since January 2013. The two-tower structure spans 775,000 sq. ft and includes 224,000 sq. ft of office space, a residential tower of 181 furnished and serviced residences , a two-storey secured parking garage, and a retail area that will service both towers. Within the residential tower, 117 studio and one-bedroom units will be fully managed by Radisson Blu. Amenities include two swimming pools, a children’s play area, restaurants and lounges and a state of the art gymnasium. Development is scheduled for completion by end of 2015. Commenting on the announcement, Salim Bitar, Aujan Hospitality & Real Estate CEO, said: “This agreement marks a critical point in the development of Torres Rani. Bringing on board such a respected name in the facilities management industry as Broll shows the commitment we have to ensuring our future tenants enjoy not only top quality real estate facilities, but also best in class management of these assets. Malcolm Horne, Group CEO of Broll Property Group said: “To be involved in such a prestigious development is a great honour for our company. We share a common drive for quality and excellence in everything we do. I’m confident that this partnership will significantly help improve service delivery for not just Rani Investment, but also the future tenants of Torres Rani. Established 40 years ago, Broll Property Group is one of Africa´s leading commercial property services companies serving the investor and occupier markets. Broll has offices in 10 countries and operations in over 17 countries across Sub-Saharan Africa. Since 2004, Broll has represented CBRE in Sub-Saharan Africa and through this affiliation; Broll is able to offer unrivalled local expertise and global market knowledge to the benefit of clients. Rani Investment is the Hospitality and Real Estate business arm of Aujan Group Holding with more than $500 million of committed investments in the Middle East and Africa. Its mission is to ensure superior returns to its shareholders through pioneering investments that are guided by its philosophy of long term horizon and tolerance for measured risks. Founded in 1975, Broll Property Group is one of Africa’s leading commercial property services company with offices in 10 countries and operations in over 17 countries across Sub-Saharan Africa. Since 2004, Broll has represented CBRE in Sub-Saharan Africa and through this affiliation; Broll is able to offer unrivalled local expertise and global market knowledge to the benefit of clients. We are affiliated to CBRE, a renowned global commercial real estate and investment firm which enables us to offer unrivalled local expertise and global market knowledge with the sole purpose of maximising the potential of your property. We offer services which include asset management and consulting, corporate real estate services, facilities management, industrial, investment and office broking, property and project management, retail leasing and projects, research, shopping centre management, valuation and advisory services, own patented Broll-Online property-management software solution and a property search function with a vast database of properties across South Africa and Sub-Saharan Africa where we have operations.